Texthelp’s Read&Write Gold for Mac, Version 6, has something to offer writers and readers of all ages and abilities, from high achievers and mainstreamers to English language learners and those struggling with dyslexia. Quality and Effectiveness: Texthelp’s Read&Write solutions are available for Macintosh, Windows, and iOS platforms. Version 6, the latest release for Macintosh, continues to improve on the flexibility and versatility of an already robust toolkit, providing instant access to digital aids for writing, reading, research, and study, from a redesigned toolbar that can portray its contents as icons, icons with text, or text only buttons. Apps include text-to-speech read aloud, spelling checker, dictionary, picture dictionary, verb checker, screenshot reader, language translator, fact finder, calculator, word prediction, and more. Ease of Use: Read&Write Gold for Macintosh contains about two dozen tools that appear in an always-visible toolbar. Only the tools most relevant to a particular task display. By presenting only a limited number of tools for each task, Texthelp reduces toolbar button clutter, minimizing the possibility of overwhelming the user. Users can further customize each toolbar, adding or removing the apps that display to suit individual work styles. Creative Use of Technology: The strength of Read&Write Gold for Mac is the sheer number of useful tools integrated into one program toolkit. One of my favorite Read&Write Gold tools is the screenshot reader, which automatically reads the highlighted text. Suitability for Use in a School Environment: Read&Write Gold adds support for Google Docs via the Chrome browser, a feature useful for schools that have adopted Google Apps for Education. While it does not read aloud Doc, Sheet, or Slide contents, it will read aloud items on the Google Drive interface, including document titles and menu options. • Tools can be customized to adapt to individual student needs. 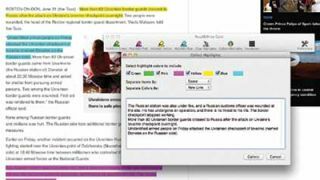 OVERALL RATING: Read&Write Gold for Macintosh scores high marks for bundling a full range of reading, writing, research, and study skill tools in one elegant toolbar.